If there’s one constant in the UAV industry today, it’s that the number of platforms is continually on the rise. Since I began seeking out my first commercial drone platform back in 2011, the industry has exploded, growing in an exponential fashion. Learning about commercial drones available on the market today and making a final choice can be a daunting task, a maze that is easy to lose yourself in. The purpose of this post is to discuss the process of entering the professional UAV market, and to assist with the best approach when deciding on a UAV platform. In my experience, I’ve found that UAV selection should not start with the aircraft itself, but rather the sensor(s) that it carries. Your final data deliverables, and the primary industry that you are operating in, should dictate what type of sensor you should use and then you should decide on an unmanned aircraft to carry that payload. It’s very easy to get caught up in the aircraft technology itself, and to settle for the camera that is shipped with that fancy looking aircraft. With today’s advances in flight times, you don’t necessarily have to jump at a fixed wing UAV if you are focused on mapping applications, although they are designed to cover much more ground over less time than a multirotor. This decision also depends on the size of site that you are planning to focus on. Small farms, quarries, construction sites and landfills are a few examples of sites that can often be easily covered and mapped by a multirotor unit with average flight time. Nonetheless, I would recommend starting the decision making process at the payload. To describe the decision-making process, we can start with the film industry. If you are on a commercial film set without the latest in camera technology, then flight time, rotor configuration, performance in heavy wind or other indicators will be secondary. The production team will care a lot more about the resolution, stillness, and overall quality of the video being captured. It’s true that many of these elements go together, but the camera is the starting point, with other decisions on the platform to follow. 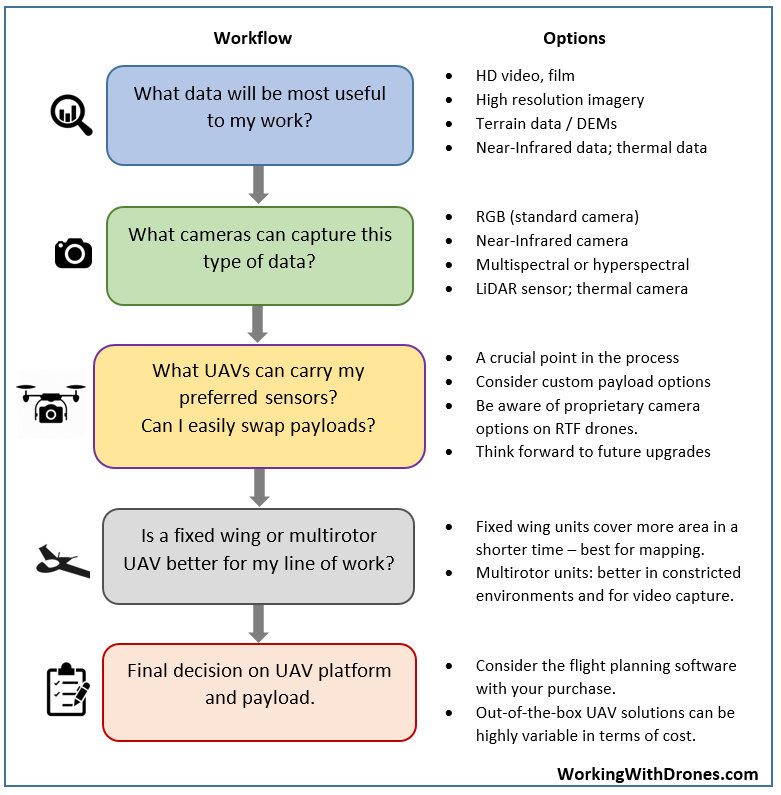 The flowchart below outlines my recommended decision-making process when searching for a commercial UAV platform, regardless of your business sector. On the flip side, there are other industry sectors where a top of the line camera isn’t necessarily crucial. One example of this is in construction monitoring. A brand new, bleeding edge camera mounted on that drone is not as important as it would be in cinematography, for example. When compiling orthophotos of a construction site, one can get away with a camera that is even a couple of years old, and the results would be quite usable. On occasion, a more important factor is the style of camera that is used here, and not the newness of it. In agriculture, it’s best to have access to the near-infrared spectrum to assess crop/vegetation health through indices such as NDVI. While multispectral cameras can be quite expensive, it’s not quite the same technology race as that which exists in the film world. To recap, the overall UAV setup should start with a decision on the camera, with everything else to follow. Shake it to start, or launch that catapult…then let it fly and land, all by itself. We’ve all seen these easy-to-fly systems like the eBee from Sensefly or the UX5 from Trimble, both major players in the commercial UAV market. A big part of this success is the ease of use – you can learn how to fly them in an autonomous mapping mode very quickly. I was comfortable in only a few hours after first touching Sensefly’s earliest model (Swinglet CAM). Of course, it is a best practice to learn to fly these drones in full manual mode before attempting autopilot (which takes longer without previous experience), but that’s another topic altogether. Ease of use comes at a cost though, as it’s currently tens of thousands of dollars for some of these mainstream systems. The eBee can retail up to CAD $60,000 for the RTK version (ouch!) and the UX5 is in a similarly steep price category. Another factor in the hefty price tag is the flight planning software that is packaged with these systems. You are paying for software that has been developed and tested extensively by a team of engineers that have optimized the entire system to (hopefully) operate flawlessly. These companies put a lot of effort in reducing the amount of error that can creep into a UAV mission, maximizing battery life, and making the flight planning process as seamless as possible. But is this convenience worth the price tag? In many cases, the answer is yes. An RTF solution can allow you to immediately enter the commercial market and complete many successful flight missions without having to worry about how that custom wiring or new gimbal setup may hold up on that next flight. With so many Ready-to-Fly (RTF) commercial options available today, many people overlook the option of a custom UAV build, and I’m not necessarily talking about a DIY project. Personally, I’ve always been more focused on the data and mapping side of this industry, so I look to others that are much more skilled at building UAVs from scratch. One of the biggest advantages to considering a custom (or ARF) build is that you are not tied to the camera or expensive proprietary batteries that come stock with the platform by the manufacturer. In addition, you could mount multiple cameras simultaneously to maximize data collection and reduce the number of flight missions necessary. When you purchase a proprietary RTF solution like an Aeryon Scout, or any of the others discussed earlier, your camera selection and payload setup is often restricted to cameras developed by the UAV manufacturer. When you expand into new sectors and new UAV business opportunities, you may find yourself forced back to the company for a newer or different style of camera. They can now charge you whatever they want for that upgrade or proprietary camera that fits onto your UAV. With a custom solution, you have a wide range of options when it comes to cameras, configurations and future upgrades, but there are also some disadvantages, and more potential for issues to arise. An inexperienced builder can be exposed quite easily if the wrong components are combined, if the UAV is not configured properly, or proper testing is not performed, just to name a few. In addition, when mapping with UAVs, the optimal camera settings are crucial. This is not the case with many of the RTF units, which often come out of the box already optimized and ready for that first flight mission. If you are deciding on your first commercial UAV platform, the good news is you have a huge number of options in today’s growing drone market. With increased competition comes increasingly competitive prices between UAV manufacturers. I have attempted to create a UAV registry that provides a breakdown of the RTF systems available today, along with their specs. While this may help the decision-making process, do not forget that the payload is the heart of what you are delivering as a commercial drone operator. It is wise to start there to make sure your aircraft can deliver the data that you and your clients need, while keeping the door open to new and affordable options in the future. Mike Morellato is the lead author and founder of WorkingWithDrones.com. He works with UAVs and their data at Strategic in Campbell River, BC (Canada).